San Francisco needs you. Join your neighbors on Saturday September 8, as they get swept up with civic pride and all do their part to keep their city clean. The ask is simple: Love Our City. Grab a broom and dustpan, sweep the sidewalk in front of your home or business and pick up litter in your neighborhood. Together, they can make a meaningful, positive impact. If you don’t have the tools you need to get the job done, Public Works does, You can get supplies the morning of September 8 during a Love Our City event at a neighborhood kickoff location near you. Let them know you’re part of the team by registering here or by calling 415-641-2600. 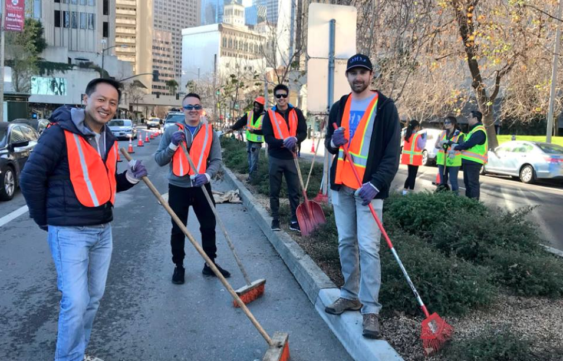 San Francisco is one of the most beautiful cities in the world and it takes teamwork to keep it looking good. On September 8, they’ll make a community-wide push to improve their neighborhoods with a goal of keeping the momentum going. Every day. Love Our City. Join the team. Keep SF clean.